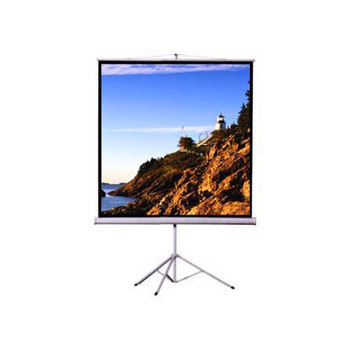 Offered by us is Compact Tripod Screen that is highly portable, simple and operational. It is extremely appreciated for its superior quality plastic frame, light weight and elegant appearance. Besides, it comes with plastic lock, light & fast to use and very convenient to open. Besides, this screen is equipped with pressured safety suspension, casing level adjustment and keystone adjustments. Available with us is Motorized & Electric Screen, which comes with a 1.0 gain matte white fabric, a dual switch facility (wired & wireless remote), RF frequency and uses tubular motor. To enhance the elegant look of this screen, it is provided with square casing. PVC technology is used to coat the white cover for aesthetic feel. To fix this screen on the wall or ceiling, the designer multi-functional bracket is considered as an ideal option. Plug and play switch is provided with the screen. Besides, this screen is used for education facilities, home theaters, boardrooms and recreational sites. We are proficient in offering our clients Portable Floor Screen, which comes with a slim and light aluminum structure. This screen is designed by the professionals, lifts up and out of its glossy aluminum case and can be used immediately. This screen is light in weight and self-standing; therefore can be moved anywhere. Besides, it is highly suitable for traveling or business presentations. A pneumatic scissor mechanism is used to raise and lower the screen surface. Our clients can avail from us Easy Fold Screen, which is a large stage series screen and can be easily installed & stored away. This screen comes in large size up to 300” diagonal. Besides, this screen fabric can be replaced at affordable prices. This screen is known for its numerous features such as portable, and easy to carry. We offer this screen in front and real fabric and can be customized as per the specifications detailed by the customers.